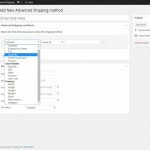 WooCommerce Advanced Shipping has been released some weeks ago, but never got introduced on here. 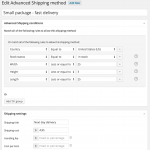 Anyone who is looking for a nice allround shipping plugin for WooCommerce, I would recommend reading further in this article as it will explain what to expect from the plugin. Lets start with a small explanation what the plugin is and does. 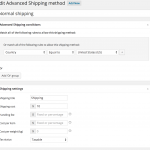 WooCommerce Advanced Shipping allows you to create (multiple) shipping methods. Of course no-one wants all shipping methods available for every person, state, country, weight, quantity, etcetera. This is where the Conditional Logic of the plugin comes in. When clicking the ‘condition’ drop down you will see a list of conditions to choose from. Take a look at the screenshot on the right to see the conditions that are available when you install the plugin. Any of these conditions can be used to restrict the created shipping method. Lets use Country for example in this post. I think #1 and #2 speak for themselves, when using the ‘Equal to’ operator, the (going to select) value should equal to the customers (shipping) Country. 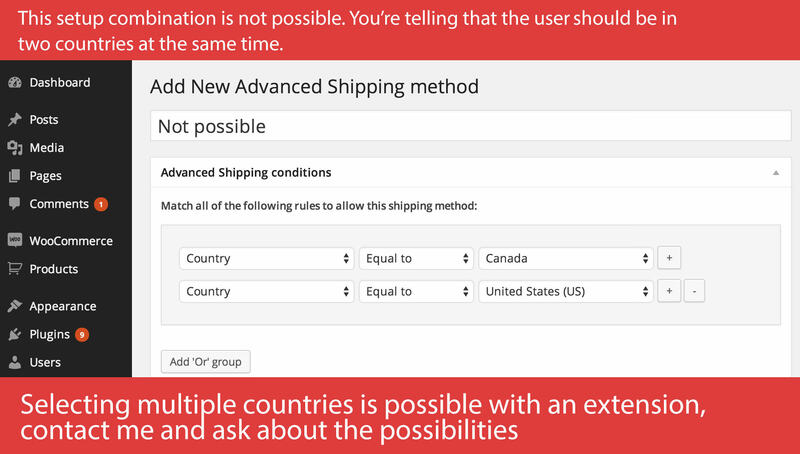 When choosing the ‘Not Equal to’ operator, it will exclude the shipping method from any customer that will have set his shipping Country to the selected value. When you change the ‘Condition’ drop down, you will notice that the value field will display a loading icon and soon after will display a field. This is because not every condition has the same field type and possible drop down options. When done loading (should take less than a second on most conditions), it can display a text field or a drop down. When there’s a drop down it will contain all the possible values you can choose from. In a text field you can set your own input value. For this example, all countries will be in the drop down if you’ve set-up your shop to sell to specific countries. You probably already noticed the ‘+’ button after a (each) condition. When clicking this button, it will automatically add a new condition row where you can set extra condition that needs to be met to allow the shipping method. This way you can combine it to set different shipping rates for e.g. weight, subtotal, quantity etcetera. 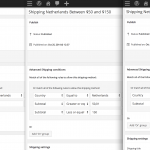 In the screenshot on the right you see thee browser screens, each with one shipping method created for shipping to the Netherlands. 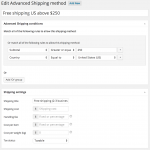 In the example the shipping costs are divided by the subtotal of the cart. If your order is more expensive, you will pay more shipping costs. Although there are three shipping methods, the user will only see one shipping methods with how the subtotal conditions are set-up. For those who’ve paid good attention to the screenshots might have seen the ‘Add Or group’ button below the condition. This button adds en entirely different condition group to your conditions. When working with conditions groups, all conditions in just one of the condition groups need to be met when the shipping method will be displayed. This way it will be easier to group shipping rates with the same name/costs without having to create new of shipping methods. 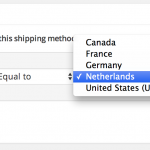 In the example in the right, this shipping method will display if a user has the shipping country set to; Netherlands OR France OR Germany. Below all the conditions you’ve got a second box with some settings. In this settings area you can set the shipping title and some different shipping price options. Shipping costs: Fill in the shipping costs you want to charge to the customer, empty or 0 is free. Only numbers are possible. Handling fee: Extra handling fee, this is a one-time costs like shipping costs, this can be a number or a percentage (use percentage sign to set percentages. E.g. 5%). Cost per item: Set the price that will be calculated per item, this includes quantity. This field can be a number or percentage. Cost per weight: This fee will be multiplied by the amount of weight the customer has in his cart. 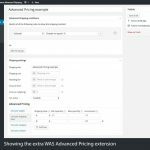 If you have the need to setup some more advanced shipping cost, using the extra WAS Advanced Pricing extension would be a great addition. This extension allows you to add cost on a per product, shipping class and category basis. In addition to that, it also allows you to setup weight based shipping more easily and quickly from within one shipping rate. With the WAS Advanced Pricing extension you can setup the advanced cost based on minimum and maximum quantities added to the cart, subtotal of the selected category / shipping class, or the weight of the selected category / shipping class products in the cart. 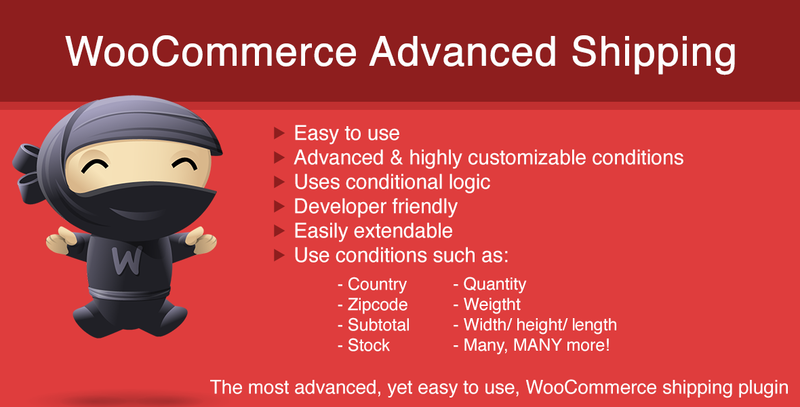 Hope you liked this introduction of WooCommerce Advanced Shipping. Feel free to post any questions or remarks about the plugin. Got a pre-sale or support question? Feel free to reach out to me! I'm a professional WordPress plugin developer on a mission to create the best plugins for my clients. I'm specialised in developing general WordPress, WooCommerce and Easy Digital Downloads plugins. Interested in talking about a WordPress project? Get in touch! Thanks for this tutorial Jeroen! Hi Jeroen. I see that there is an update available but I am not sure how to do it. I would like to keeo my current shipping settings so please help. The shipping settings are saved in the database, so these won’t get lost when updating. You can download the latest version from CodeCanyon, and replace the current WAS plugin folder via FTP, or update via the plugins page in your WordPress dashboard. 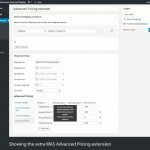 Hi – does this plugin pull in pricing from specific shipping carriers? Or do we still need another plugin for that? I missed both your and Geoge’s comment, so also for you sorry for my late reply. 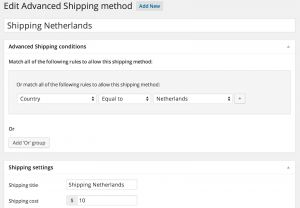 WooCommerce Advanced Shipping allows you to create new shipping rates, it is not possible to pull prices from other shipping plugins. Hi there – I have been searching and reading and wanted to find out if this was the right product for our needs. We want free shipping over $75 in the cart – and hide the other options what ever they end being. Can this do that? Yes, there is a option to ‘Hide other shipping when free is available’, which does hide all but the free one(s). 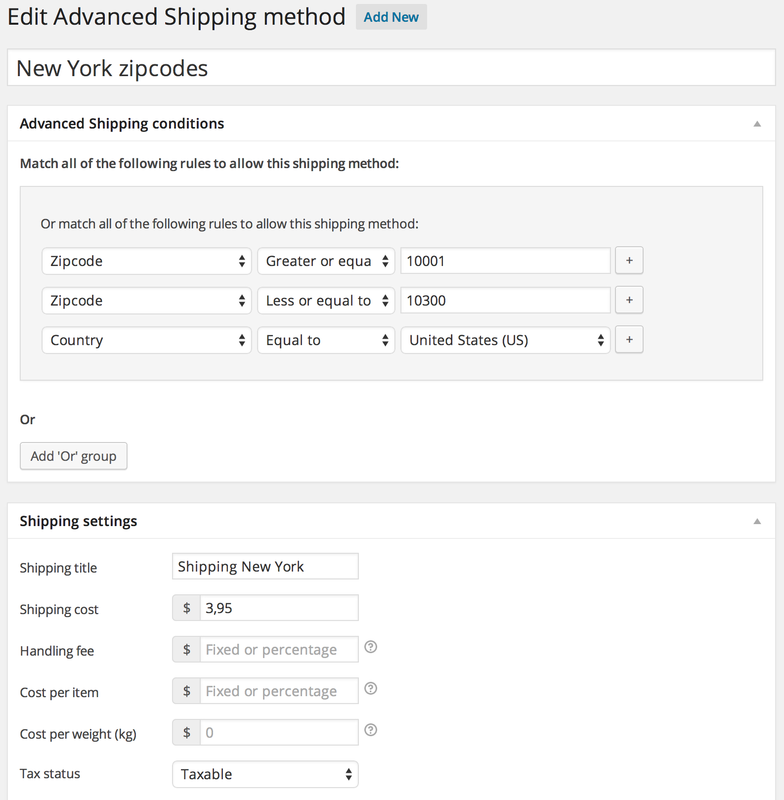 I’m interested on buying the WooCommerce Advanced Shipping plugin, but I need to know first if I can make a list of about 700 cities (with 4 different shipping rates) to make it availible on the shipping calculator? This should be possible, but I haven’t tried that many cities before. I already have an extension that works with zip codes, but because of my target audience I need too make it availible to calculate their shipping rates by just searching for their city in a list in my shop. You can add the cities there and see if it works for your needs. hi, how can i exclude the cheaper shipping class cost? If you buy 2 product with 2 different shipping class in the cart the buyer can choice the shipping method with the related shipping cost. I have a customer that wants also this option. To have only the biggest shipment when several products are on cart. How can I do it, please! Is quite urgent. quite a nice thing. How do I combine Categories in the rules? It says that “all products in cart must match category” and I want it to make it either or. You can add a ‘or’ condition group, do note that it requires to set all the other conditions. Unfortunately it is not possible at this point to add it within the same condition group. I have a large condition group (28) that each include one additional condition. For example, one group is: State equal to North Carolina, Contains Shipping Class 6 Pack. Another in the groups is: State equal to Tennessee, Contains shipping Class 6 Pack. State equal to Tennessee, Contains Shipping Class Case. It would be a huge time saver if the entire group could be duplicated. Interesting plugin this is something I am looking for but I am not sure if it it does what I really need, can you please advise? What I am trying to achieve is the following: to restrict the shipping if a product of a certain category is not in the cart and the cart total value doesn’t reach a certain amount. For example in a pizza delivery shop the customer cannot chose delivery only with drinks in the cart, it is mandatory to buy a pizza or pasta in order to be able to deliver the beverages. Can you please tell me if I can achieve the above situation with your plugin? Yes this would be possible. Though you would need a extension script that I’ve got ready to set a ‘contains category’ condition (there is a ‘category’ condition, but this requires ALL products in the cart to have the given category, while ‘contains category’ requires at least one). Hi – looks like this could be just what I am after. Could you please confirm a couple of points? – can I set rates by shipping class by State? 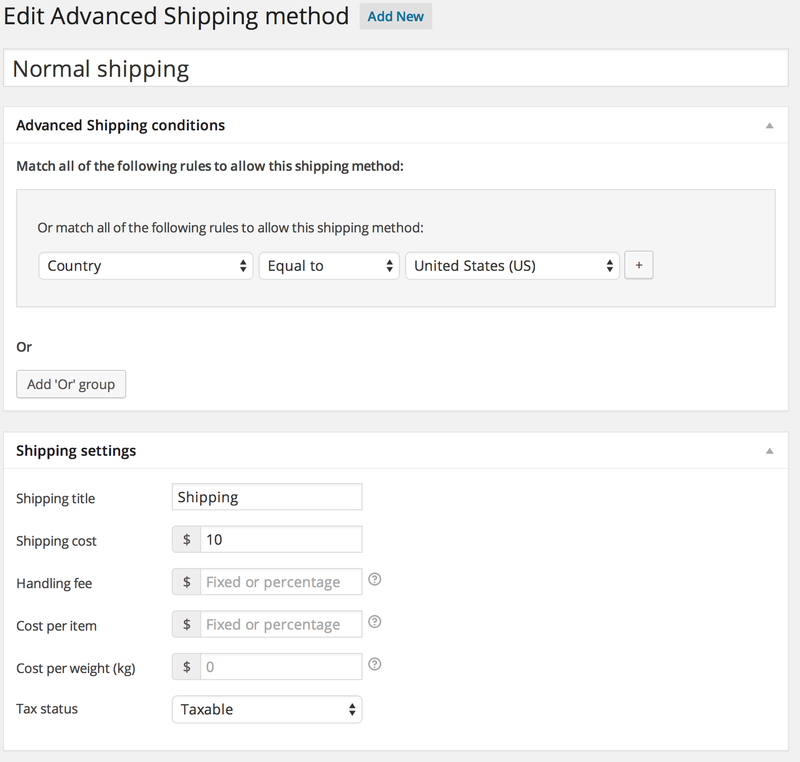 – can rates for different shipping classes as above be combined for a total shipping fee? e.g. I sell flowers and gift baskets on my site. They are shipped from seperate locations, so if both are purchased together, I need to charge shipping for both. I also have different rates for each shipping class per state. You can then create a rate for each state. Let me know if you’ve got any further questions. Is it possible to set prices by total cart volume? Adding the volume of each product, and having different ranges for different total volumes in cubic meters? We are doing shippings for big products, and we need to charge different for a small truck, a medium truck, or a large truck. It is possible to set a ‘Volume’ condition if you add that with a extension script that I’ve got available. That way you can set a – greater – and – less – condition for the volume, and set your pricing according that. It is adding the right amount now, maybe you changed it in the meanwhile. I got two times the Happy ninja, for $24, and being charged $1.92. I don’t think it’s related to cache… tried again in other computers and cleaning cache, and still doesn’t work. I’m trying to emulate this situation: if the user lives in Brazil, state of São Paulo, and he chooses this one specific product, the cost per item needs to be a percentage over the price this product costs. Could you help me on that? I’m willing to buy the plugin but I need to be sure i can make it work. Can you take a look at the demo site and see if the current setup shipping method works for you? (demo site resets itself every 24h so hopefully you’ll be able to view it). Otherwise, could you create a method and notify me? On other thoughts, if this is only for taxes, it might make more sense to actually set the shop taxes for specific location..? My problem happens specifically at the “COST PER ITEM” field. If you could send me an e-mail, i cannot seem to find yours at the website. We are trying to disable one of the free shipping promo if coupons are applied. My problem is that coupons do not only consist of numbers so greater/less/equal to is not really valid in this example. Is there any way we can work this out with the plugin? There is no easy way to exclude all coupons (it is possible by adding all ‘coupon’ => ‘not equal to’ => ‘Coupon_1’ conditions). The ‘Coupon’ condition is only valid with the ‘Equal’ and ‘Not equal’ operators (even if all are numbers), its setup to match the exact coupon code. The plugin is made to be easily extendable, so you could custom code an extra condition ‘Has coupon’ => “yes/no”. – The Quantity based pricing on dealer 3, that is possible if its based on the cart quantity, if its product specific quantity that might be a bit more difficult. i want to create countries group for advance shipping method. or i can say one method is for more than one country?? how can i do it in woocomerece?? 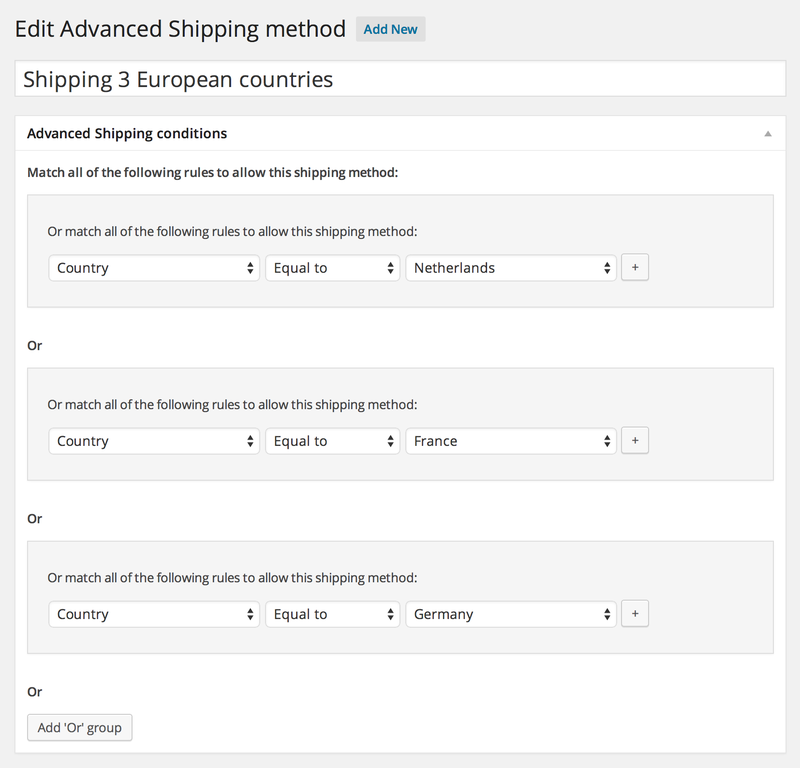 I’m looking to prevent shipping to certain countries if a cart has too many of one shipping class in it (import restrictions). Would this be possible using WAS? Although it is possible to recognise a certain shipping class and quantity in the cart, it isn’t possible to say X amount of shipping class Y (the quantity condition is based on the cart total quantity). With a small amount of custom code you will be able to create a custom condition with something like ‘5 or more quantity or class’ – equal to – Y. If you’re able to do such thing, I can send you an example script on how to create a custom condition. this plugin is the best, but I found one problem. I have a lot of methods in Advanced Shipping but I want some method only for some payment method, but I can only choose this plugin with all methods. 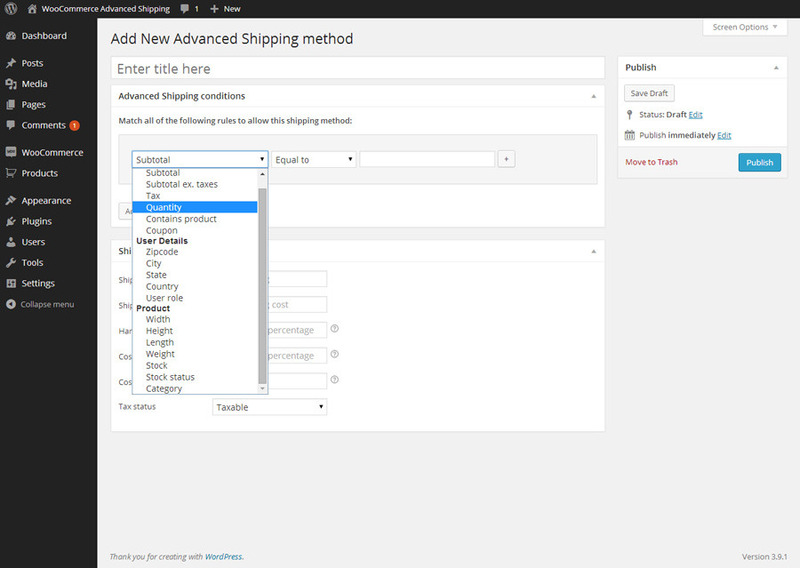 Unfortunately there is no easy way of selecting the created shippings in a drop down like that, that is due to the way the shipping rates are added to WooCommerce (WC only lists the shipping methods as you see at the top under the ‘Shipping’ tab). Currently there is a (bit techy) workaround which requires a manual change in the database. I have it on my list to see if there is a way to submit a patch to the WooCommerce core that works for everyone. Can’t say if/when the other solution will be possible. I have two shipping options UPS and USPS would it be possible to combine these two shipping options when a customer order any products? That is not possible with WooCommerce Advanced Shipping. 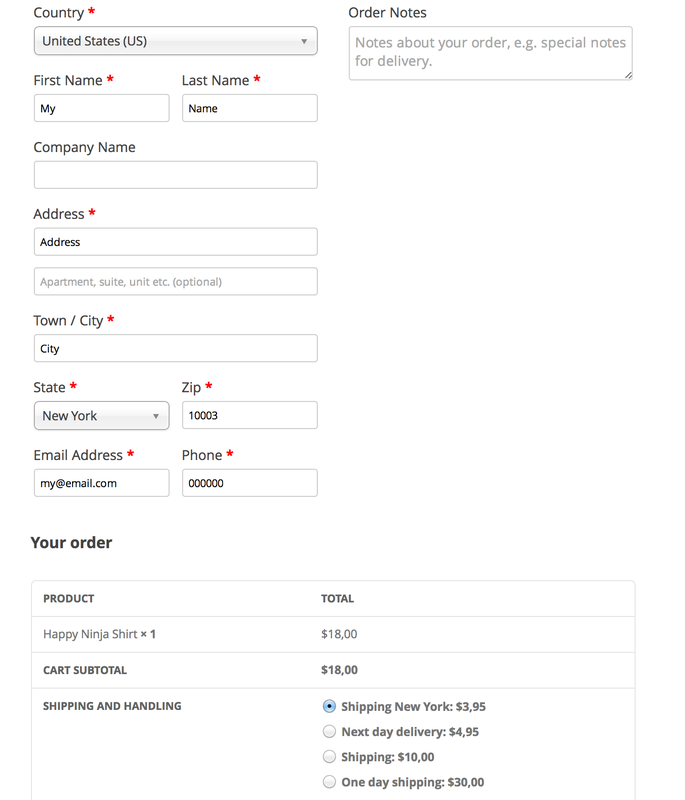 WAS ‘only’ allows you to create new shipping rates, and not modify existing ones from carriers. Is there a way to combine shipping costs? For example, I have 1 product(lets call it product A) that costs $34 each to ship 2-day and another product(product B) that costs $45 to ship 2-day. If someone were to put 2 product A and 1 product B in their cart it should cost $113 for 2-day shipping. I will still need to do the same thing for overnight shipping too. Any help would be great. It will basically allow you to set a shipping price per product, which will be added up to one shipping rate. Hi, I am confused, and just a marketing guy not a code person. I do not see it mentioned anywhere, and when I logged into the demo, I did not see the functionality either. Will the plugin allow for both USPS and FEDEX shipping using weights and dimensions? Actually yeah you can, just find the cost per gram that they charge and set up the conditions for the shipping method. The dimensions condition will take alot of setting up but weights are easier. To answer your question yes it is as long as you know the rates from the courier. I just had a quick example that I wanted to check and make sure would work with this plugin before I bought it. I know I can I have it so that If there is 3 x Books(category) in the cart it costs $4 postage for the first one and $1 for every extra. However if I also add 1 x Vinyl Record(category) to the cart, I want the postage cost of the books to change to $1 for the first one and $1 for every extra. So to spell it out. At the moment this setup is not possible. I am working on a update to make this possible with the WAS Advanced Pricing extension, but I don’t have an ETA on that just yet (expected in a few weeks). Sorry I don’t have better news for you! Thanks for getting back to me. That’s alright, we’re not in a huge rush, even a month would be fine. Is there anywhere I can stay up to date with plugin so I know when you have updated that extension? You’ve got quite the confusing setup, now that I re-read it multiple times, I actually think it can be accomplished already with the WooCommerce Advanced Pricing plugin + the WAS Advanced Pricing extension! Sorry for the earlier message saying it couldn’t be done ATM. I purchased the plugin and sent you a message via that form, just awaiting your reply. I looked at my inbox and saw a message from you on Aug 24th, I replied that same day. Did you get my mail? (maybe spam folder as it did contain two attachments). I tried a thing on the demo site but cannot get it to work: The foundation that I create a new site for sells some small books and DVD’s in small quantities. In the Netherlands, as you may know, there is a shipping method with a reduced price if the package is basically in big envelope range: less than 380x265x32mm and 2kg. I tried on the demo site to recreate this scenario. Added a few products with some dimensions. I have to say that I am only interrested in the combined height of the stack of products. In my case, the sum of the heights of the products. Unfortunately it does not seem to work. Even though I added a condition to my shipping method, the method remained long after the stack reached the given boundary of 2.6 cm. (I have to take a foam envelope in account too). Do I make a mistake or is this not how your plug in works? The height/width/length conditions are setup to compare the given value against the Highest/Widest/Lengthiest products in the cart. This indeed may not work in your scenario. The reason it is like that is because when you stack items side-by-side for example it may fit multiple items. I have a extension script available that lets you set a ‘volume’ condition, maybe that will work in your case? The other option would be is to change the matching functionality / create a new custom condition to match the totalled height. For both I have example scripts available on how to add a new condition / change the matching functionality. This does require just a bit of technical/programming skills. If you could provide me the two scripts… I will test which one would work best for my situation. I think that the second script will do the trick, but just maybe the volume option may be a bit more flexible in the end. Sorry I may not have been completely clear there, I got the ‘volume’ script ready and available, but if you want to change the actual matching functionality you’d need do get some custom coding done 😉 (I do got some example scripts available for that though). b) the quantity of each item, line by line, in the cart. What I would like is to be able to calculate shipping according to the total number of items being purchased. So if they buy 1-5 items – any items – the total shipping cost is $7. If they buy 6-10 items, the cost is $12, etc. The ‘quantity’ condition is based on the total cart items. This might be to obvious to ask , can I add additional cost for another Item? on total items in a cart i need to calculate if volumetric weight is heavier than weight given and charge shipping based on the higher amount. Is it possible to do this with your good extension? As you can see i need also a field to add a Volumetric Divisor (For example 1mc=200kg) to calculate the volumetric weight… Can i do this? It is not possible by default with the plugin. I think you can create a custom condition that will match against the (1mc=200kg) amount and that will allow you to setup shipping rates where you compare the weight and the ‘Volumetric weight’ and set the shipping costs according to that. Other question… your plugin is Multilanguage compatible? WPML is ok? Thanx… I’ll wait your info to buy your plugin! There is no code specifically created for WPML at this moment (expected to do so soon). What I usually recommend is creating shipping rates based on the country and set the shipping title related to that. Does this plugin work with Multiple Shipping Addresses plugin from woocommerce? Multiple shipping addresses breaks an order up into multiple shipping orders so if a customer orders say 10 items he can ship it to 10 different addresses. That would depend on the Multiple Shipping Address plugin and how it works. If it works with shipping packages it should work, but do note that the WAS plugin does support shipping packages up till a certain point. Can you tell me what your shipping goals are? I am interested in this plugin, but I also have a couple questions. I’m planning on shipping to different ‘zones’ in the US but I need my two products to have separate, individual shipping costs. Can I designate the price of shipping per product per zone with this plugin? If so, how? I was also wondering is this an annual or a monthly ( plugin) fee? Yes, you can set that up. 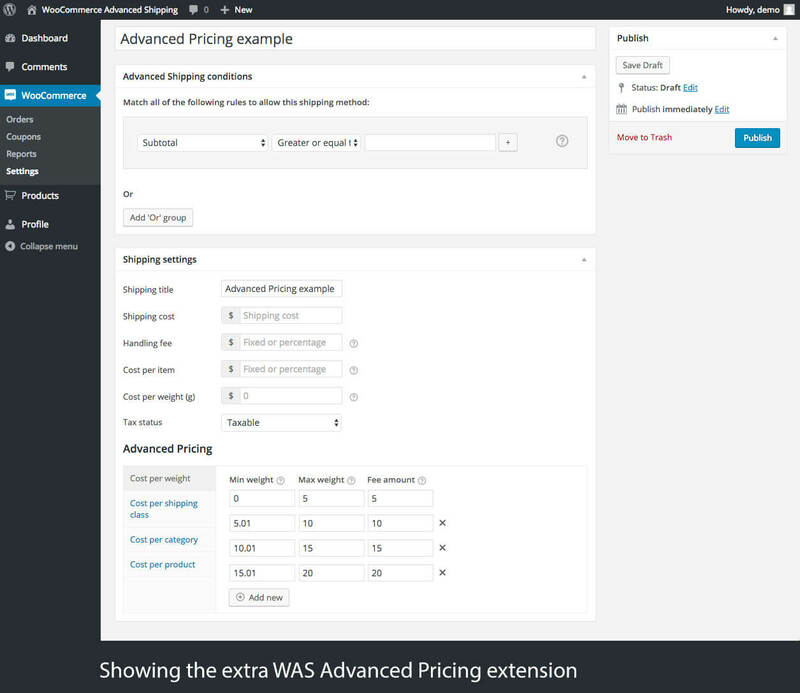 and to add separate cost per product the WAS Advanced Pricing extension comes in handy. The plugin is sold on CodeCanyon, its a one-time payment for the plugin, and support is for 6 months (or you can buy extra 6 months on there for a couple bucks extra), more explained about that on CodeCanyon self (its their policy ;-). To set above options – can I use your plugin? 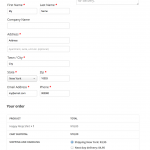 Yes this is possible to setup with WooCommerce Advanced Shipping. Can I do without any plugin – just WooCommerce software only? Could you tell me how can I do it? I spent much time to find some way. Sorry for the confusion here, both solutions I suggested require the WooCommerce Advanced Shipping plugin. The #2 suggestion requires a extra extension on top of that to make it a bit easier. Store A, sells item A, located on Country A. Store B, sells item B, located on Country B. -If customers want to buy JUST item A, they only will be charged with shipping fee from Country A. -If customers want to buy JUST item B, they only will be charged with shipping fee from Country B. -If customers want to buy item A and item B, then they will be charged with shipping fee from country A and country B. My question is, can this plugin do this for me? The problem is simple but I always thought that there is no WC plugin that can combine shipping from 2 different locations, at one store. I always asked some developers and they said, create different store for each country, so that I have 2 stores, and the problem solved. I followed this but I am not satisfied with the result. I want to do ‘cross selling’ thing (item A and item B are related to each other, so it would be great to combine them into one shop), but the only problem is how to tell the store that if customer want item A and item B they will be charged with two shipping fees (because of the fact that A and B are stored in different locations). If this plugin can do that, how to do so, in short description? I am sorry if my previous comment could be confusing. The fact that this plugin is almost perfect for ‘TO’ countries (destination), basically I am asking what if there are multiple ‘FROM’ country, could I use this plugin to combine the shipping free from that different countries? It would depend on the exact shipping cost you need to setup. It is possible with the WAS Advanced Pricing extension to setup cost per category. Hope that answers your question, please let me know if you have any other doubts! Ok, thank you very much!! 🙂 I appreciate all the answers to my questions and great support! hello Jeroen, I want to set up shipping for a client who sells large items, of various sizes, with different shipping costs for each item. I also want to further vary the shipping costs depending on 3 geographical zones – local, UK and rest of Europe. Is this possible with your plugin? Thanks! OK Jeroen, thanks for that info. So, how do I get the extensions – do they come with the Advanced Shipping plugin? Great Jeroen, have just done that. Great service! Can you tell me if this plugin will work with the woocommerce product vendors plugin? We need every seller to be able to set where they ship to when they list a product. There’s no specific functionalty build in for that plugin at the moment. I’m not sure how that plugin works, but I do think it will need a bit of customization to make it work nicely together, especially if you want the vendors to setup their own shipping rates. I hope that answers your question at least for a part (maybe a bit vague). Please let me know if you have any other questions. I have a website that offers products through WooCommerce. The people I work for just asked me to set up a store on our WP site. So we have 3 items on it now. They want to offer different methods for free shipping per item. For one item, they want it to where if you buy 3 or more of that product, you’ll get free shipping. Another one is the same way, buy 2 to get free shipping. Is there a way using your plug-in that I can set these different shipping methods for each individual product? This would be a challenge to setup. It could be possible depending on how you’d want to setup the shipping cost for the other items. For example, with the WAS Advanced Pricing extension it is possible to setup cost per item (quantity based). So for example, you can set its costs X for 1 of this product, and free for 2+ of this product. Not sure if that’ll fit your needs. I have the Australia Post plug in to calculate international shipping charges. My problem is, If a customer orders 1 item to be sent to China, shipping charge is $45.50..if he orders 2 items, shipping charge is $91.00 (the store calculates the 2 items as individual deliveries). The actual charge for the 2 items (as 1 delivery) should be $60.00. Does your Advanced Shipping Plug in solve my problem and integrate with Australia Post? The WooCommerce Advanced Shipping plugin doesn’t integrate with any shipping carrier plugin. It ‘only’ allows you to setup your own shipping rates. If needed, you maybe could re-create the AUS post shipping rates inside the plugin though. Thanks for your quick reply. How hard is it to recreate the Australia Post shipping rates inside the plug in? Would I be able to do it with your instructions? I don’t know how the AUS post shipping rates are build up, so I wouldn’t dare to say that.. I have set 4 different shipping methods, depending on the shipping method and specific product category will add 50% more to shipping cost, ex. if i select 2nd day ($30) and have 2 products the shipping will increase to $45. Is this possible with your plugin? It sounds like you want to modify existing shipping rates, is that right? If so, the WAS plugin ‘only’ allows you to create your own shipping rates. That said, the shipping setup in your comment can be created in the WAS plugin itself (2 products => $45 shipping). I’m reading your documentation but I have a problem. I have a basic configuration and 2 shipping classes: small product, big product. I want to configure the price of the shipping by the number of products in my cart. If I buy a single product, the cost should be 10€, but if I buy two products it should be 10€ + 8€(the second product) and 3 products 10€ + 8€ (2nd) + 8€ (3th)… It’s possible this configuration? 2) If these rates go for each product, its also possible to do this: Shipping cost: $2, cost per item $8. That way the first one is $10, and each following $8. 3) The WAS Advanced Pricing extension will allow you to setup shipping cost per shipping class (per quantity) if thats what you’re looking for. Great plugin but I can’t configure it. Is it possible to reach you by phone? Sorry, but I don’t provide support over the phone. It’s not possible to set a empty default option at the top. Note that the drop down feature is being removed from WC in version 2.5, so using radio buttons may be recommended. 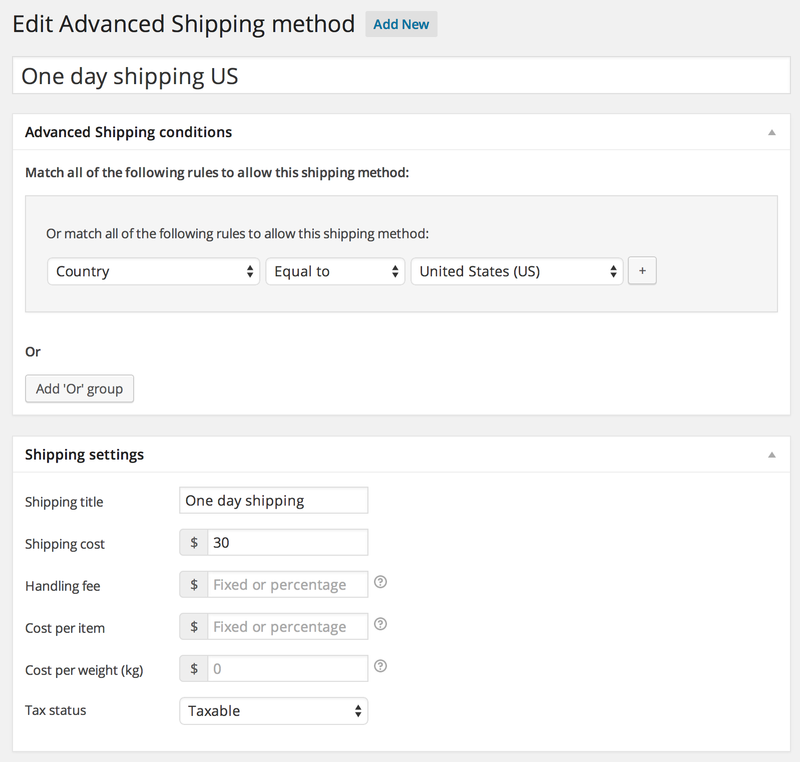 With that, you can also set the priority of the default shipping rate, which would also be useful in your scenario. I am thinking about purchasing your plugin. Can I use your plugin to configure how I want it to be with my Shipping requirements above? Secondly, we are thinking of offering free + shipping . Will this plugin do the job or the one your are promoting above..
Is there a way to get your plugin to use “Shipping Class” in the same way that it uses “Product Categories”? I would really like to use Shipping Class to set the condition that all items in the basket must be of a specific Class. Or that there must be no items of a specific class in the basket. I have an extension script available that adds a ‘shipping class’ condition that behaves like the ‘category’ one. 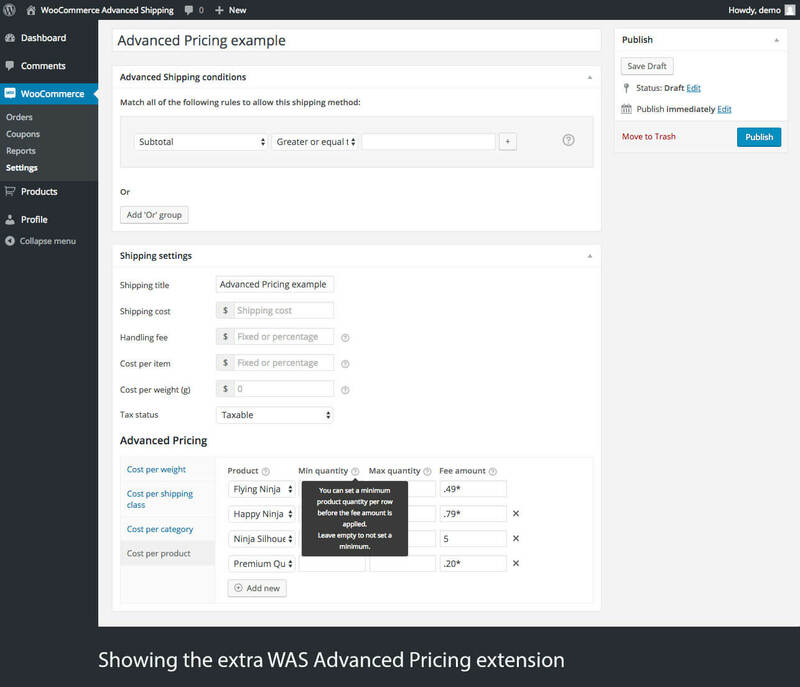 Bro Can you Please Describe how can we add advance pricing with the plugin specific product advance pricing tab is not displaying?? It was possible to purchase an extend license? 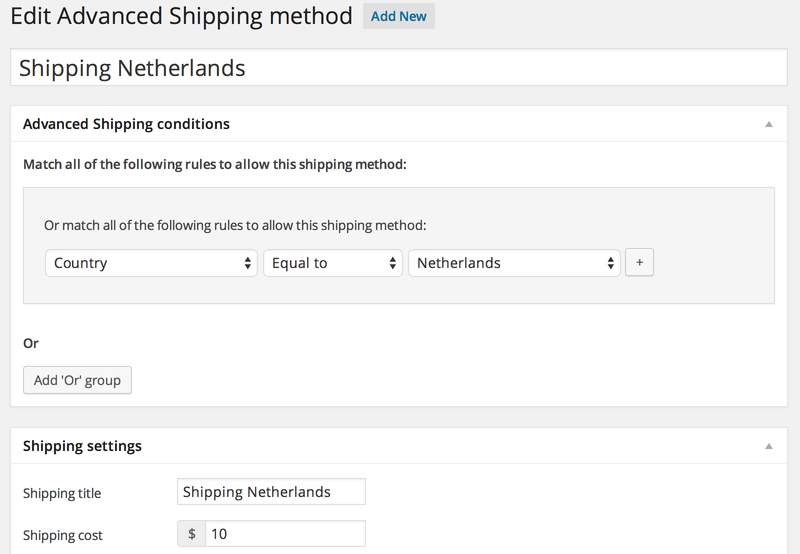 Ik werk met de WooCommerce price measurment plug-in. Een klant moet eerst de lengte en breedte zelf ingeven alvorens de prijs berekend wordt. Bij bepaalde productcategorieën zal er een verzendtoeslag gerekend bij het overschrijden van een breedte van 120, boven op de huidige (vaste) verzendkosten. Dit wilde ik graag met de Advanced Shipping plug-in doen. Omdat dede Measurment plug-in niet op de demo site staat, kan ik helaas niet testen of deze plug-ins samenwerken. 1. Werken de plug-ins samen en is dit te realiseren? 2. Wat als een product in meerdere productcategorieën valt, waarbij niet alle categorieën aan een verzendtoeslag zouden moeten krijgen? Graag hoor ik spoedig van je. Hello! I think this plugin may do what I need but I want to be sure. I need to be able to set it so that if a customer is purchasing at least X number of a specific product, it changes to a flat shipping cost. I’ll be using this in combination with a bulk discount plugin. If customer buys 5 of Widget A, they pay $10 apiece, and pay a flat shipping fee of $50. If customer buys 5 of Widget B, all standard prices and shipping costs apply. The bulk pricing, of course, will be handled with the other plugin – does this plugin allow for the per-product volume condition? Yes, you can set this up with the plugin, but you do need a extension script that I have available for a custom ‘product quantity’ condition 😉 (the normal quantity condition is based on the total cart quantity). reading your introduction to the plugin I came to impression that this is the plugin I am looking for. Also is it possible to display a message after the user adds a product in the cart. Or if order total is above 100 but adding current product makes the order weight greater than 10 – display a message that free shipping is available only for weight below 10. Yes, you can setup the three mentioned scenario’s with the plugin. As far as i can see from demo, it takes only first option, even though i have 2kg weight og cart. Can you help me please? It is definitely possible to setup these shipping rates. It’s really a great plugin and available at very low cost. I am glad i found it and didn’t buy the expensive version of this form woothemes. Hi There – I need to create multiple shipping costs for each of my products. ie: A book costing 10.00 needs to be shipped to UK for 1.20 Europe for 3.00 and Rest of World 3.50. Each of my products has a different shipping cost to Uk, Europe and Rest of World so one size will not fit all. Will your software enable me to do that. Also, if it does do I have to select Europe or International countries separately or is there a group Europe or International? Short answer: yes you can set this up. Is there a way of providing multiple shipping options for one order? For example: Economy and Express in a dropdown? 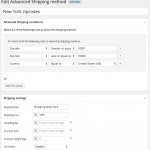 Yes, you can create multiple shipping rates in the WooCommerce Advanced Shipping plugin, and each rate that matches the setup conditions will be shown to the customer as a option. The displaying is done by WC though, and recently they removed the (user unfriendly 😉 dropdown option, so by default it will be displayed as radio buttons. Ah! So, all I do is add another set of rates for the same product/conditions, and it will be added. Thank you! Okay, I’ve tried this, by providing another set of conditions, but it still only places the one condition. One is free shipping, the other is for Express. Only the free shipping is showing (obviously cancelling the other out). Not sure what I’m doing wrong. Okay, I went back to ensure that “Hide other options when Free shipping available” was turned off, and even though I know I turned it off, it wasn’t (well, that’s what I thought). Solved. I’m curious if this is what I need. I want to be able to apply shipping per item. Ex: a person adds two pairs of free socks to their cart and gets charged twice for shipping, let’s say $3.95 x 2 for a total of $7.90. Awesome – purchasing right now! Thanks for the quick response Jeroen! Purchased earlier today (with support) and requested the extension. Thanks for the help! I didn’t receive it 🙁 Checked both email addresses and both spam folders. Didn’t get anything. Can you try and resend it to stefan.lenassi@gmail.com? I got it this time. However there was no attachment in the email!! Not sure if this is on my end, but both of the emails before yours had attachments in them. Love the plugin man! Super easy to use and solved ALL of my problems! Is there a way to hide shipping total until they fill out their address? Thanks man. I´m interested in your plugin , it seems to work very well. So I have a question, is it possible to set a specific shipping for variation on product? For example: if I have a t-shirt that has blue , yellow and black options , and I want to set a specific shipping for the option blue. You can do this by setting those products to a different shipping class assign shipping rates accordingly. Hi Jeroen , how are you ? Tks for the sort notice , I´ll buy your plugin , it will resolve my client´s problem. I purchased your plug-in and I love it! Here is my question: I have one group of products where shipping costs are calculated by the number of products purchased. And another group of products where shipping is a flat rate of $1.25 per product. The cart is now giving two options for shipping when I just want the cost of shipping added together. I cannot figure out how to correct this. Any suggestions? Is that possible for your to add this extension to this existing demo link so that we can approve this from client and purchase this. 2. If I have 196 list country, can this plugin handle prices for every country? 1) Yes, it can be used with other plugins, it doesn’t influence those plugins or anything. 2) Yes, you can setup cost per country, you can just use the ‘country’ condition for that. I wonder if you could help me with the following scenario. I have a WooCommerce shop selling paintings. I have worked out shipping methods and classes for small, medium and large paintings but I have a problem with XL and XXL paintings. Since the cost of those paintings vary a lot I cannot know the cost in advance. So I want the customer to be able to to place an order without any shipping method. At that stage I would call a courier company to quote me the best price. Then I would edit the order by entering the shipping method and cost and then I would sent the new invoice (with the payment link) to the customer. You can setup a free shipping method mentioning the shipping will be quoted later. 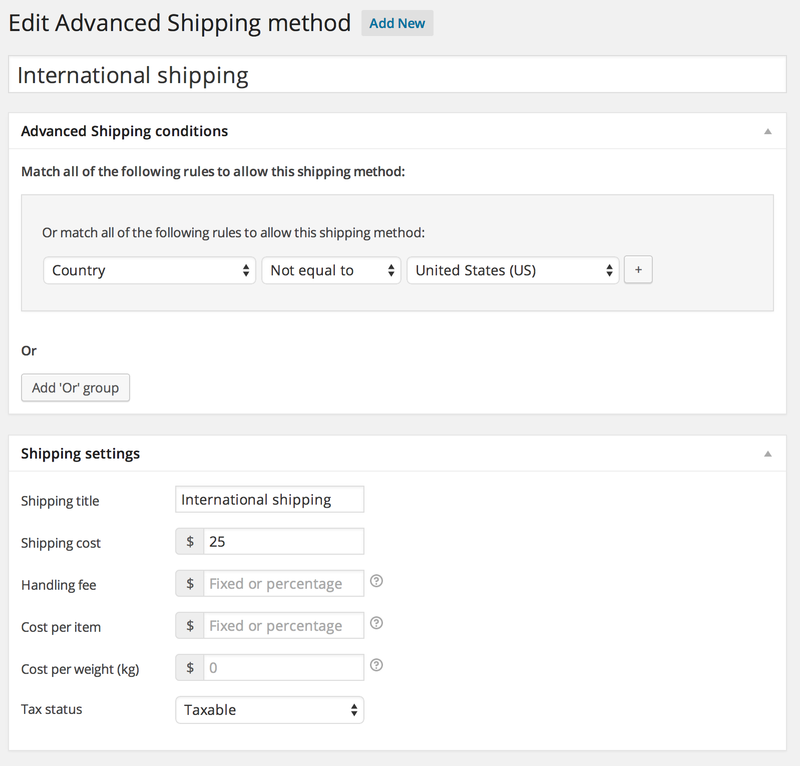 WooCommerce allows you to add the core shipping methods to a order by default, so I think that would fit your needs. 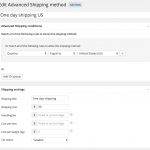 One question: what is the difference between WooCommerce Advanced Shipping and WooCommerce Extra Shipping Options? does this plugin works in wordpress 4.6 and woocommerce 2.6.4? Yes it does work with the latest versions of WordPress and WooCommerce. Hi Jeroen. How easy/difficult would it be to add the “Company” field as one of the available user conditions? (i.e. conditions are currently limited to zipcode, city, state, country & user role). Our client has some shipping rules tailored to specific companies. It is possible to setup a comma separated list of zipcodes, ranges of zipcodes like that aren’t a listed feature and thus limited supported, but it should be possible. I need to set up a shipping table as below based on order total and/or desired shipping method. Looks like your extension will easily do the % total order shipping cost, but I need to have % or minimum $ charge. Can this be done with your extension? Is it possible to set up shipping conditions by importing a table (xls or csv, for example)? Because we have a couple tables with shipping rates depending on weight and zip code from our shipping company. As prices are updated frequently (in general, each 3 months), it would take a considerable effort to set it up manually each time that prices change. So, can it be done by uploading a table, or perhaps by creating a sql command to insert rates directly into the database? As per the complexity of the conditional setup, having a import feature with csv isn’t easily possible. 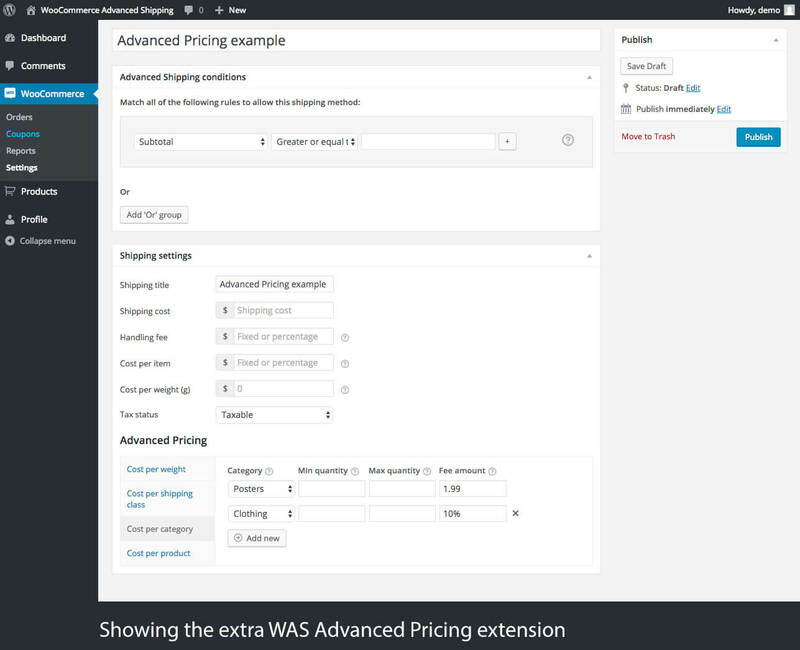 Depending on the price setup, using the WAS Advanced Pricing extension may help setting things up more quickly and easily. I have two shipping classes, LTL Freight and UPS ground. Can I set it up so that if a customer has a LTL shipment (large items with Shipping Category LTL truck freight, cost based on weight x $) and smaller items that is Shipping Catergory UPS (different weight x $) that it combines the two and charges the LTL rate and now show the UPS rate if the any of the products are LTL. I tested it calculated both items weight, but it shows both shipping options. Whether its possible to set this up depends on your more exact needs for this. 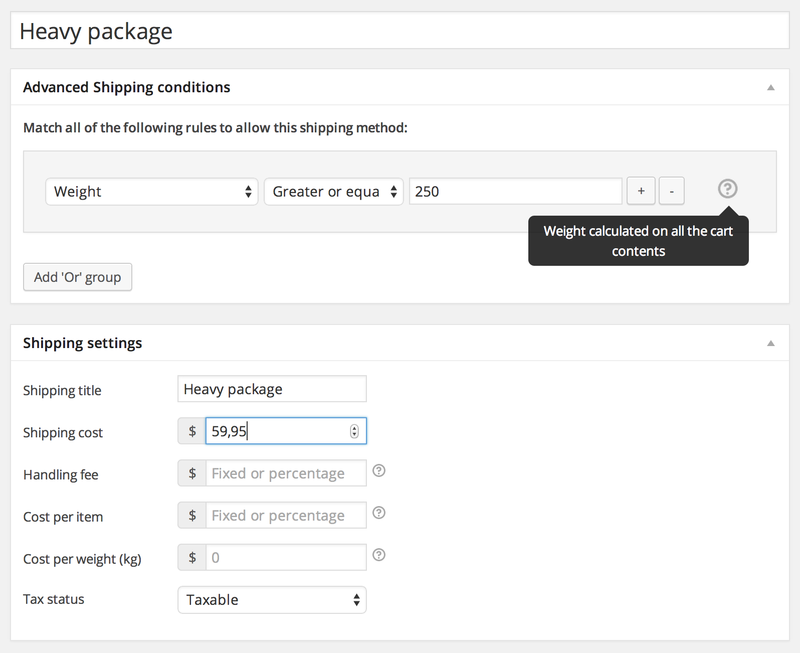 It is possible to setup weight based conditions per shipping class / category using the extra WAS Advanced Pricing extension (and then cost accordingly). I wonder if you could help me with the following scenario. I have custom condition and want to match this condition with new filed need to create it check out page , is this available with WooCommerce Advanced Shipping plugin or no. Can you please reach out to me via the proper support form? I can’t provide support through the comments. I still didn’t purchase , I want to know if my required issue available or no, then I can buy the plugin and send you a ticket . Gotcha, sorry for the confusion. Yes, you can create a custom condition for the Advanced Shipping plugin that matches based on the custom checkout field (if setup properly). This is basically the same with what I do with my Advanced Checkout Fields plugin and the custom condition for that (for the Advanced Shipping plugin). 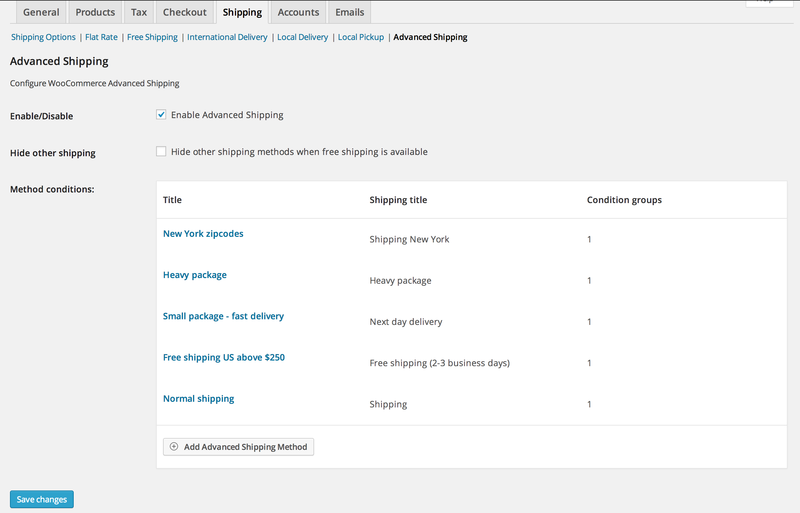 You mean that I should purchase two plugins to activate different shipping cost for different choices from custom field will create in checkout page . No thats not what I mean, I just gave that as an example that it can be done and has been done. You can still setup your own custom condition based on a custom checkout field you already have, just like I did with my other plugin. 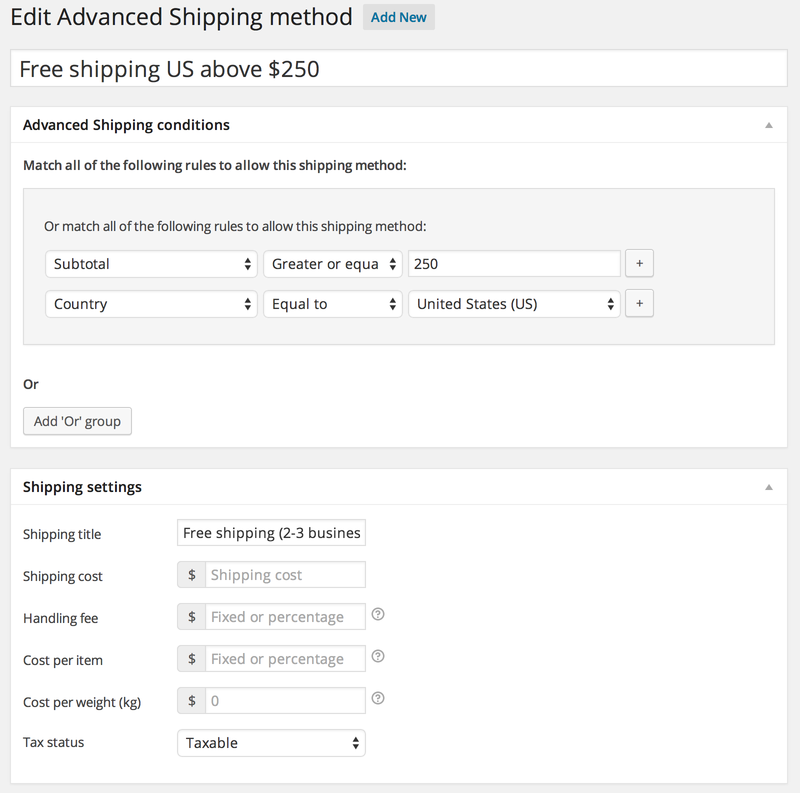 You’d only need the Advanced Shipping plugin to setup the shipping cost. I will buy it today But i want your help in this issue to match this condition with new filed. I can’t provide support on custom coding within the plugin support policy. If you have any further questions, please reach out to me through the contact forms, this is getting into a case specific conversation that is not really good for the comment section. I have multiple product classes, but i dont want to give the customer a choice of paying 1 of the classes if the customer has multiple classes in his or her cart. Productclass1 & productclass 2 in his or her cart i want the customer to pay for both classes is this possible? 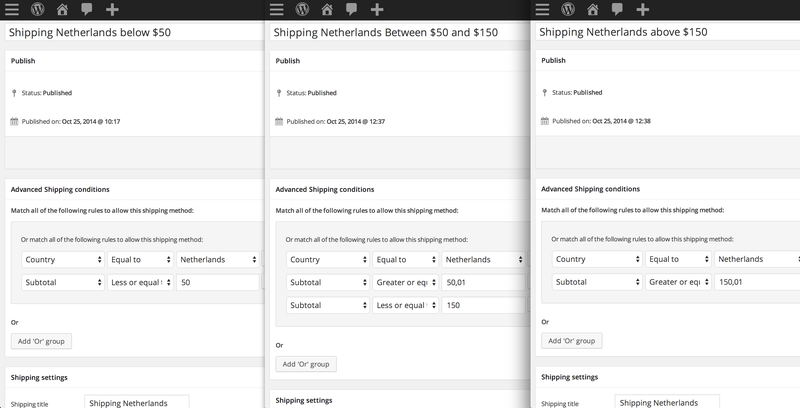 Yes it is possible to charge per shipping class and sum those up together when both are in the cart. 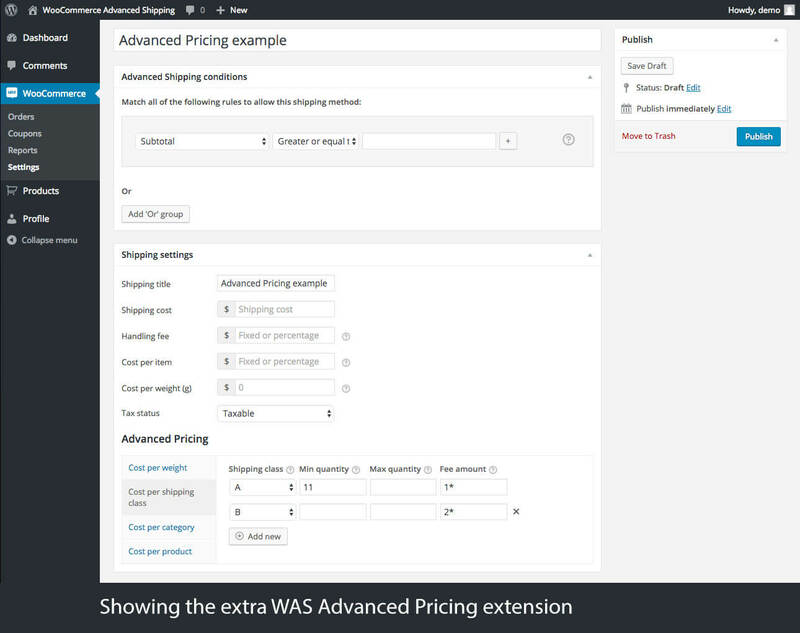 This can be done using the WAS Advanced Pricing extension. I’m struggling to find the right shipping plugin. Ok, so my question is similar to Karel above – if you have two classes of products (with basic shipping rules set up different for each) – and the customer adds the two classes of products to cart, WILL the shipping show the breakdown of the product shipping cost and then sum the shipping totals? I don’t want radio buttons on checkout for this (all other plugins are doing this). This is “already decided” shipping fees based on the class of product the customer adds to cart. I got just 2 classes. IF it can do this, I’ll buy. You mention WAS Advanced Pricing extension – is that in addition to your plugin? Cheers in advance…! The plugin does allow you to setup the cost according to shipping classes, but showing a breakdown is not a feature of the plugin. 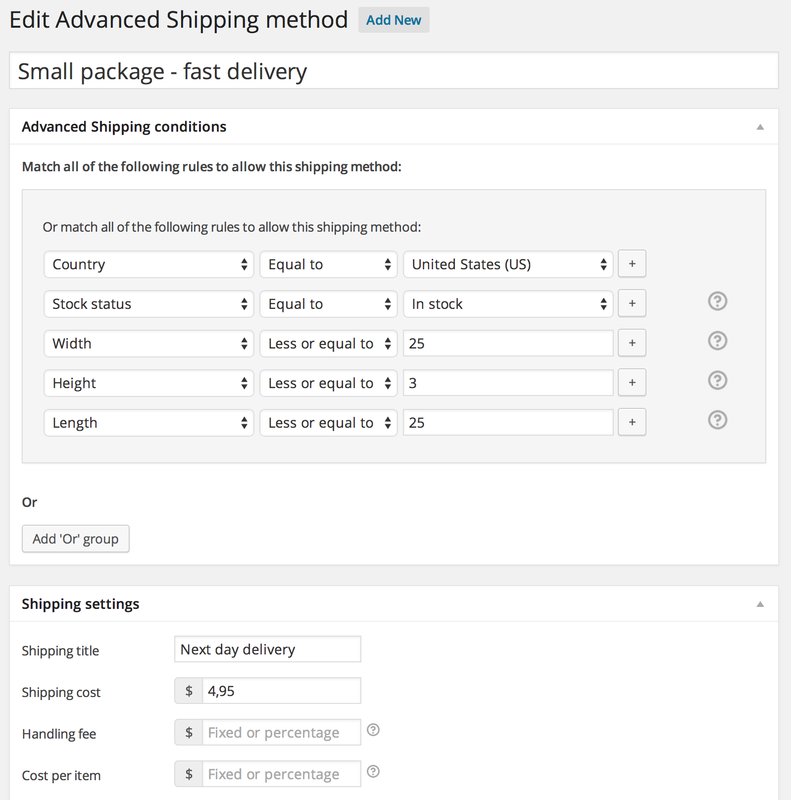 You might be able to set that up though using another plugin of mine; Extra Shipping Options this would allow you to add a ‘description’ to shipping rates based on conditions, allowing you to breakdown the cost for the customer. 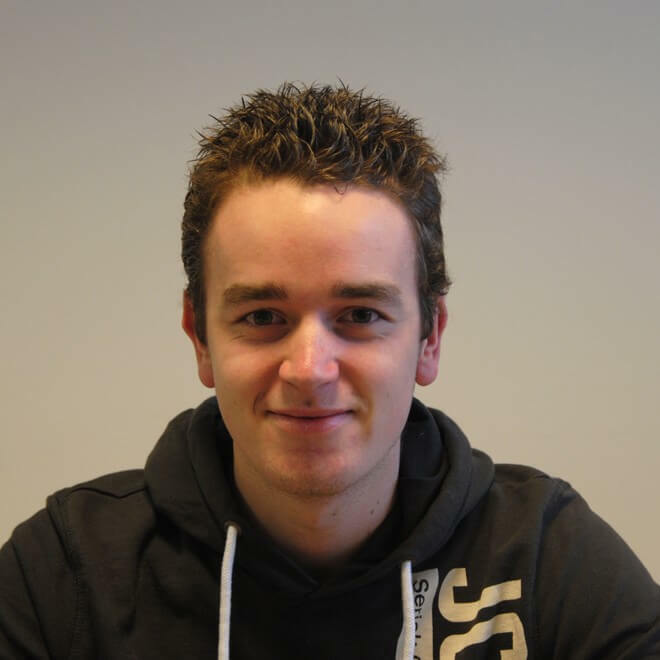 Hi Jeroen – thanks for such a fast response! So, to clarify, I’d need to purchase all 3 plugins: Shipping advanced | WAS .. | Extra Shipping Options? or just the latter two? – The Advanced Shipping and extension would allow you to setup the cost according to the shipping classes. Thanks for the clarification, it’s critical I get this sorted out! How can the following problem be solved? I want to offer four shipping options. The items 1-3 are displayed for selection. Pos. 3 does not have to be displayed. If an order exceeds 25 €, item 1 should no longer be displayed. In the case of an order abroad, after input from the RE address and LI address, e.g. The shipping option Pos.4 is displayed. Same for an order RE address. Germany and LI Address, e.g. Switzerland the shipping option 4. Can I solve the problem with your plugin? 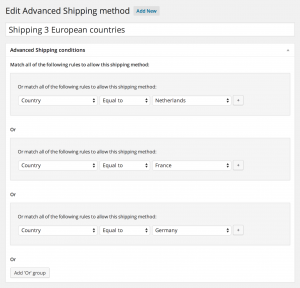 I’m not sure what you mean with RE and LI addresses, but using the Advanced Shipping plugin you are able to setup shipping based on the country and order amount. Only the shipping rates that meets the set requirements will show up for the customer as a option. I need to be able to have products that are in a certain class that have shipping according to cart total, products that have flat rate shipping according to specific products, products that have free shipping and when they are are added to the cart the shipping is totaled up and given in one amount. Is this even possible? Yes it is possible to setup these kinds of shipping rates using the Advanced Shipping and WAS Advanced Pricing extension. will this work alongside UPS and USPS shipping? or I will only be stuck with flat rate shipping? I want to use conditional flat rate for some products but for others I want them to use UPS/USPS. Please advise if this is possible. You can accomplish your scenario by splitting the cart into separate packages. This way when there are multiple products in the cart the ones you want to be shipped with U(S)PS can be shipped as such, and the ones with flat rate too. For this scenario I’d recommend using the Advanced Shipping and Advanced Shipping Packages plugins. I’m wanting to use Printful Print on Demand and my own CD’s on my site. The CD’s I post from South Africa/Wherever I am, and the Printful all gets sent from Printful. Is there a way for me to set it up so if there’s a CD and a Printful item in the cart, the two different shipping rates can be shown and added to the final cost? I’m not sure how Printful works, but if you have different items / shipping cost calculated differently you can split the cart into separate packages. 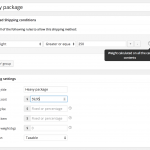 Then you can setup the shipping cost for the package using the Advanced Shipping plugin if wanted.